Sara Hagerty masterfully draws from her own story of spiritual and physical barrenness to birth in readers a new longing for God. With exquisite storytelling and reflection, Hagerty guides readers to a tender place that God is holding just for them-a place where he shapes the bitterness of lost expectations into deep, new places of knowing Him. In the age of fingertip access to answers and a limitless supply of ambitions, where do we find the God who was birthed in dirt and straw? Sara Hagerty found him when life stopped working for her. She found him when she was a young adult mired in spiritual busyness and when she was a new bride with doubts about whether her fledgling marriage would survive. She found him alone in the night as she cradled her longing for babies who did not come. She found him as she kissed the faces of children on another continent who had lived years without a mommy's touch. Whatever lost expectations readers are facing-in family, career, singleness, or marriage-Every Bitter Thing Is Sweet will bring them closer to a God who longs for them to know him more. What does it look like to know God's nearness when life breaks? What does it mean to receive his life when earthly life remains barren? How can God turn the bitterness of unmet desire into new flavors of joy? With exquisite storytelling and reflection, Hagerty brings readers back to hope, back to healing, back to a place that God is holding for them alone-a place where the unseen is more real than what the eye can perceive. A place where every bitter thing is sweet. 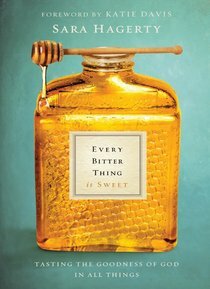 About "Every Bitter Thing is Sweet"